Cox Communications is teaming up with the folks at Lou&apos;s Place to host a virtual reality truck experience! Don&apos;t miss out on an outdoor DJ, food and drinks on the patio. The week-long excitement begins Mar. 13 and lasts through the first days of the tournament. Read more here. Come early and be part of the action as eight teams take to the court throughout the day on Open Practice Day at INTRUST Bank Arena. This free event will let you get a feel for the basketball talent in downtown Wichita. Learn more here. Tailgating fans unite! 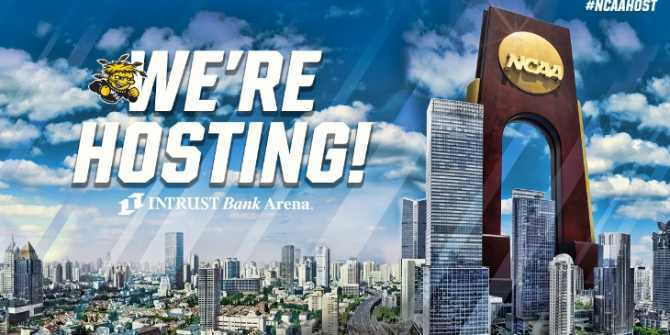 Be part of the excitement directly west of INTRUST Bank Arena as Wichita Brewing Company sets up large tents, tables and chairs to watch the games throughout the day. Don’t miss out on Saturday where the party takes a fun St. Patrick’s Day turn. For more information, click here. Across the street from where the games are happening, guests and fans will find the largest indoor/outdoor sports bar in downtown Wichita. Equipped with fire pits, live entertainment, food, drinks and a venue businesses can rent out for private parties, Brick + Mortar Venue is opening its doors to endless possibilities. Enjoy a St. Patrick’s Day party Saturday with festive food and drink. Find the complete schedule here. Basketball fans can taste handcrafted beers made special for a week of sports celebration just steps away from INTRUST Bank Arena. Watch and play games with Third Place Brewing with their indoor/outdoor bar experience. See what else they have to offer here. Commerce will shut down for a weeklong party in the streets! From tailgate parties to live music, art, food and drinks, there’s a little something for everyone at this huge sports celebration. To learn more about what to expect, click here. You don’t need tournament tickets to enjoy this celebration! Join the festivities by watching games live on a giant screen in the middle of downtown Wichita. From a live DJ, food trucks and beer to an opportunity to show off your own basketball skills, this is one downtown event you won’t want to miss. Click here for details. Don&apos;t miss this patio party equipped with a live DJ, bagpipers and a slam dunk contest. Find out more here. Enjoy local fare from Public while dancing the night away to live music in the Brickyard. The Brickyard Bash includes several days of excitement and a St. Patrick&apos;s Day celebration on Saturday. See what kind of music you can expect here. Wichita Festivals, Inc., which is responsible for huge events like Riverfest, is teaming up with Barleycorn’s to set up a festive zone for food, drink, fun and game-watching directly south of INTRUST Bank Arena. With tons of tailgating games, food and drinks available, Bracket Bash is even bringing a little St. Patrick’s Day cheer to downtown Wichita. Full details are listed here. Fill your tummy with breakfast, lunch and dinner brought to you by the Wichita Wagonmasters as you enjoy live music all day and night outside this popular Wichita bar. Get in on the fun here. For more events happening during the tournament, head to our calendar of events page. Check out our complete guide to the tournament here.